The Pomeroy Foundation is now accepting applications for the program’s latest grant round. Application materials for Legends & Lore markers are available on the Foundation’s website. The deadline for applying is Wednesday, October 31, 2018. Since the program’s launch in 2015, the Pomeroy Foundation has already helped more than 35 communities in New York to commemorate their own fascinating local stories. Municipalities and charitable 501(c)(3) organizations in New York are welcome to apply. Local historical organizations or municipal historians will often apply on behalf of property owners. 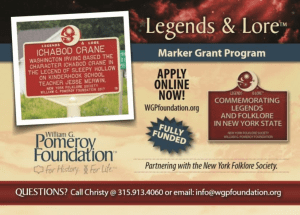 For information about all of the Foundation’s historic signage programs, grant guidelines, and how to apply, click here or call (315) 913-4060.